Doors - L.J. 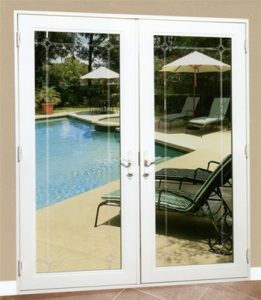 Hausner Construction Co.
Patio doors, also known as sliding doors, are a functional way to open up your home to our wonderful Southern California climate. They offer great views so you can add natural light and beauty to your home. Another benefit is because they do not swing open and closed, but rather slide on a track, sliding doors do not take up additional space in a room – making them a great option for small spaces. 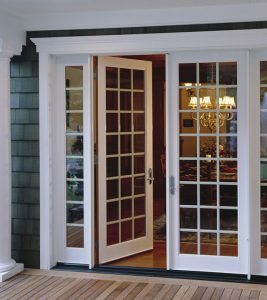 Hausner Construction offers premium vinyl patio doors from our own LanCar Collection. All patio doors in our LanCar Collection are Energy Star® Certified, so you can start saving money on energy costs from the day they are installed. They feature energy-efficient, dual-pane glass to keep heat out in summer and warmth in during the winter. The sturdy frames are made of PVC vinyl compound and hold up well to heavy use. Sliding doors from Hausner Construction offer a variety of modern design options, including distinctive hardware and grilles between the panes to create the look of French doors. You can also select built-in blinds that open and close via an exterior control, and never need to be cleaned. Our patio doors provide the easy care of premium vinyl, combined with beauty and long-term performance. Building upon a standard insulated, dual-pane glass unit, our glass comes optional with argon gas fill between the sealed glass panes to provide additional thermal insulation benefits. Low-e glass usage offers a virtually invisible glass coating that provides insulation benefits as well as control for uncomfortable solar heat gain. Other glass options include tints, various privacy obscure styles, laminated glass and tempered safety glass. 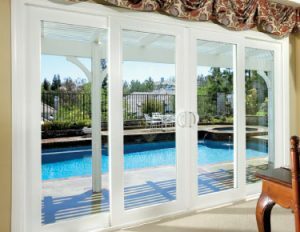 Get the best patio doors for your home, installed by the best team in Riverside, Long Beach, San Bernardino, Chula Vista and surrounding areas. Give LJ Hausner Construction Company a call today at 800-698-2005 or complete our online free in-home consultation form.